Creamy pudding made with tapioca pearls. 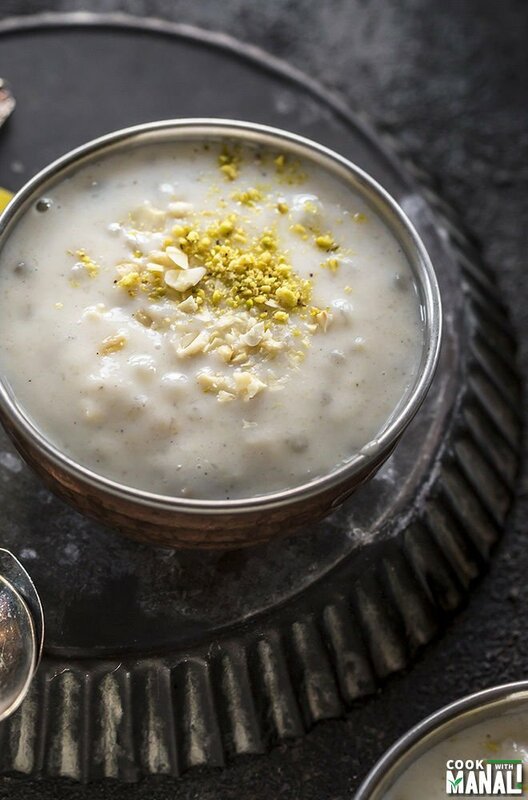 This Sabudana Kheer is extremely popular during the fasting season of Navratri in India! 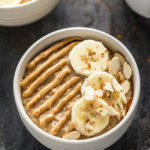 It’s gluten-free and made in the Instant Pot! Indians are celebrating Navratri worldwide this week. The festival of Navratri lasts for 9 days (nav=nine and ratri=nights) during which people pray to goddess Durga, keep fast and eat vegetarian meals only. My childhood memories of Navratri revolve aronund food. While my dad used to fast for all 9 days, I was always more interested in the yummy fasting food. So during the fast in Navratri, you are not allowed to eat grains like rice, wheat. You also can’t eat lentils, regular salt, onion, garlic and so many other things. But in spite of all the restrictions, the food is so fingerlicking good! There are sorts of things made with potatoes and paneer, sabudana (tapioca pearls), kuttu (buckwheat flour) and so much more! One of my absolute favorites is this Sabudana Khichdi. 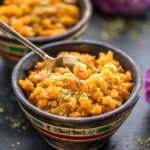 It’s quick, easy and so delicious! Almost everyone l know loves it. 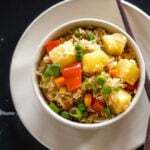 Don’t forget to check out the recipe for the perfect non-sticky Sabudana Khichdi. Desserts are also made in abundance during Navratri. 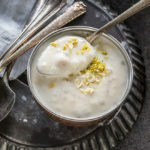 In my home, mom always made 2 sweets quite often during fasting – lauki ki kheer (pudding made with bottle gourd) and sabudana kheer (pudding made with tapioca pearls). While mom always made sabudana kheer on stove top, I made it in my Instant Pot! It’s really simple with only 3 main ingredients – sabudana, milk and sugar. The rest of the ingredients cardamom powder, nuts and raisins are optional but recommended. I highly recommend not skipping the cardamom, its so good there! I suggest using whole milk for this recipe if you like your kheer creamy. If you don’t care then you can very well use low fat milk. Keep in mind the kheer thickens considerably as it cools down. So it might look watery at first but will become super creamy as it cools. 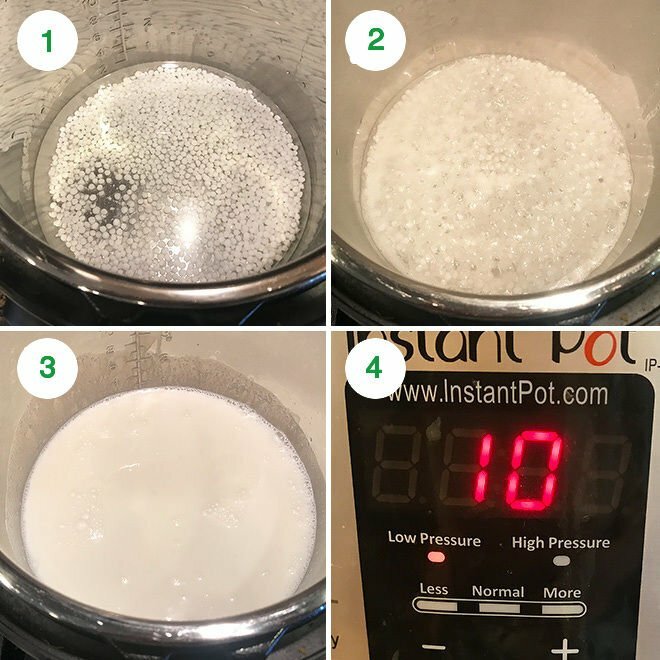 To make sabudana kheer in the Instant Pot, I first soaked the sabudana for 15 minutes in my Instant Pot (with the Instant Pot turned off) and then cooked it along with milk and water and low pressure. Once the sabudana is cooked, I added sugar, cardamom, nuts and raisins and it was done. So simple that anyone can make it! You can skip the nuts and raisins though if you are not a fan. Sarvesh isn’t huge on raisins so I skip them sometimes. 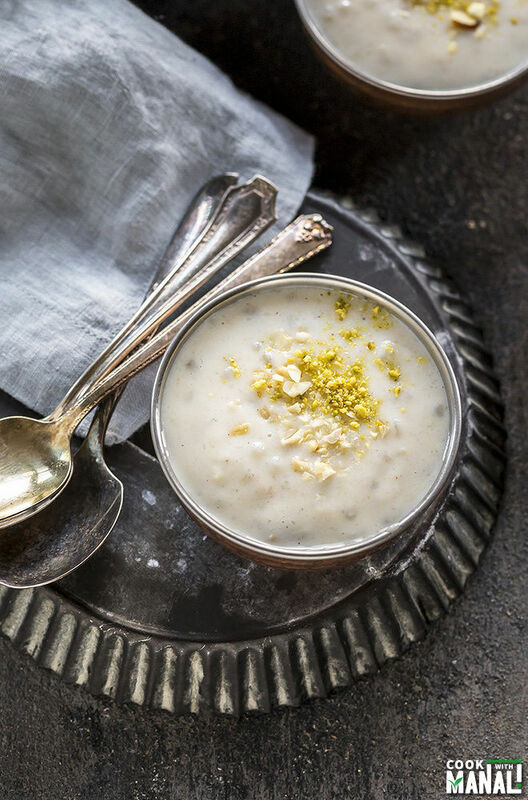 This sabudana kheer is naturally gluten-free. Can You Make Sabudana Kheer Vegan? 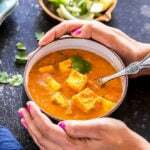 Just substitute regular milk with coconut milk, the flavors go really well together. 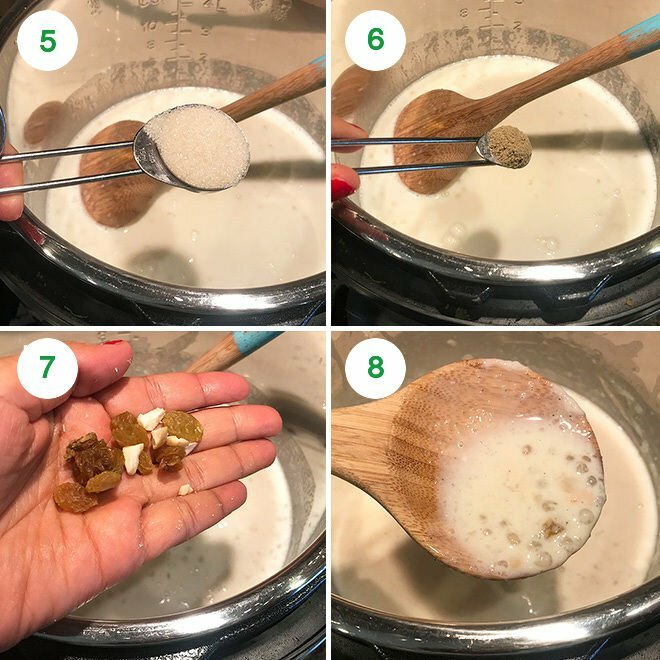 You can also make it refined sugar free and use jaggery in place of sugar. I best enjoy this sabudana kheer chilled but it’s a personal preference. If you want to eat it warm, simply add some milk and re-heat. The kheer thickens considerably so if you prefer thinner consistency, just add some milk before serving. 2- Once the sabudana has soaked for 15 minutes, plug in the Instant Pot and then press saute. Let it simmer for 5 to 6 minutes until the pearls become translucent. 3- At this point add remaining 1/2 cup (4 oz) water and 1.5 cups (12 oz) whole milk. Stir and close the pot with its lid. 4- Press the manual or pressure cook button and then use the pressure/pressure level button to set pressure to “low”. Cook on low pressure for 10 minutes, with the pressure valve in the sealing position. Let the pressure release naturally for 5 minutes and then do a quick pressure releasing by manually turning the sealing valve from sealing to venting position. 5- Open the lid and press the saute button. Add the sugar and mix. 6- Then stir in the cardamom powder. 7- Also add in the cashews and raisins. You may also add few strands of saffron if you like at this point. 8- Stir everything and let it simmer for saute for 2 minutes. Unplug the Instant Pot. Sabudana kheer is now ready, enjoy it warm or cold. The kheer will thicken and turn creamy as it cools down. You may need to add more milk to thin it up a bit before serving (if desired). I love this kheer chilled! If you’ve tried this Sabudana Kheer Recipe then don’t forget to rate the recipe! You can also follow me on Facebook, Instagram to see what’s latest in my kitchen! 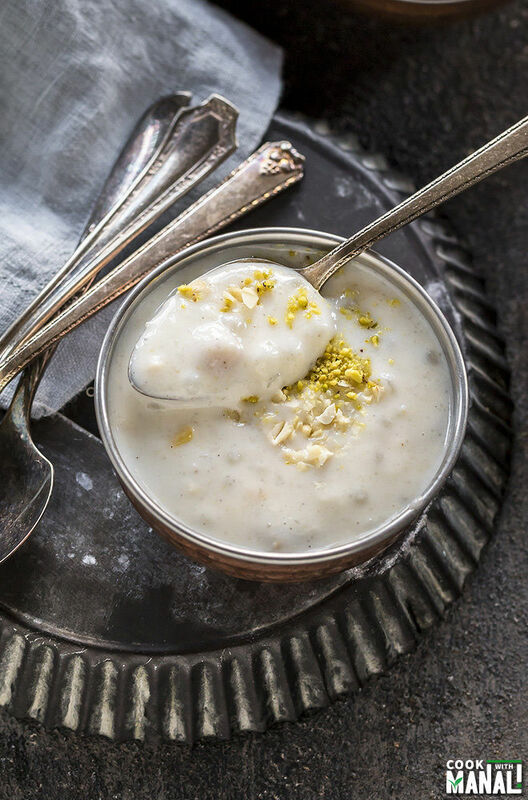 Creamy pudding made with tapioca pearls, this Sabudana Kheer is a popular dessert in India during the fasting season of Navratri. 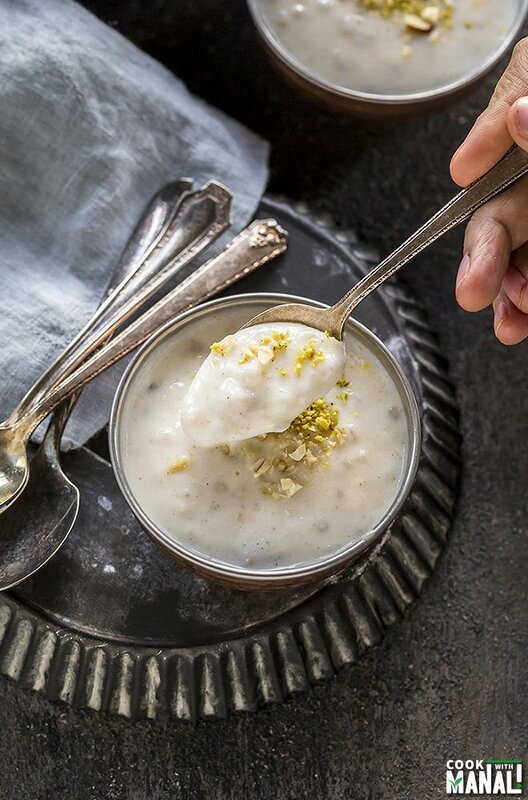 Naturally gluten-free, I made this sabudana kheer in my Instant Pot! Once the sabudana has soaked for 15 minutes, plug in the Instant Pot and then press saute. Let it simmer for 5 to 6 minutes until the pearls become translucent. At this point add remaining 1/2 cup (4 oz) water and 1.5 cups (12 oz) whole milk. Stir and close the pot with its lid. Press the manual or pressure cook button and then use the pressure/pressure level button to set pressure to "low". Cook on low pressure for 10 minutes, with the pressure valve in the sealing position. Open the lid and press the saute button. Add the sugar and mix. Then stir in the cardamom powder. Also add in the cashews and raisins. You may also add few strands of saffron if you like at this point. Stir everything and let the kheer simmer for saute for 2 minutes. 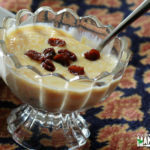 You can add some saffron strands to the kheer if you like. Looks like a very delicious dessert! I just discovered your sight today and I love it! 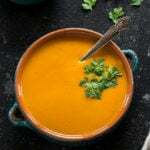 Your pictures and recipes look gorgeous! 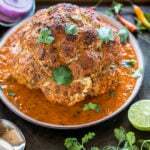 I adore Indian food and was wondering how you think this dish would hold up using full fat coconut vs whole milk? I’m vegan. Thanks and look forward to checking back in with you! 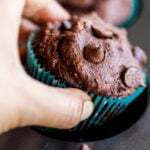 Servings are listed at the start of the recipe. This one makes 4.